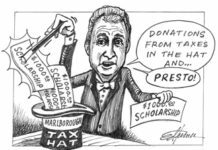 Marlborough – Mayor Arthur Vigeant asked the City Council to accept a grant in the amount of $135,000, awarded by the Department of Mental Health, at the Sept. 28 meeting. It will be used to continue funding the Police Department’s Jail Diversion Program (JDP), in conjunction with Advocates, Inc., for the next three fiscal years. The department also received a gift of $850 from the Marlborough Savings Bank. Councilor Michael Ossing thanked the local bank on behalf of the council and city residents. Both grants were graciously accepted.